uMhlanga Rocks, a multi-layered place, with multiple meanings poised between the world of nostalgia and holiday memories and that of investment and high street bustle. A key destination on KwaZulu-Natal’s North Coast, uMhlanga Rocks has recognised and embraced the changes afoot, and captured the deep connections that locals and visitors have with this place, under a new, unified vision launched at a breakfast held at the Beverly Hills Hotel on 25th November 2016. Much more than just a logo, this place-brand captures an 18-month long process guided by local and international urban place-making best practice that looks at how places, once secure in the delivery of safe, clean and well-maintained public spaces, begin to deliver an exceptional experience of place. “If you want to attract business, tourism, residents or any other group, you must communicate what makes you a compelling destination – you must capture the essence of what makes you, you, and then share it with the world,” explains Jodi Robertson brand communications director of ITI, the Durban based branding and communications agency appointed to facilitate the uMhlanga Rocks brand development process. When done right, place-making helps to make places competitive on a national and even global scale. Not only are well-defined places good for tourism and investor sectors, they impact the people who live in them, who visit them; building a sense of community and common identity, strengthening the bonds between people. “Place-making is what brings places to life beyond bricks and mortar,” says Robertson. And this is what uMhlanga Rocks will do, with a vision aimed at retaining a coastal feel and village lifestyle that is an easy, exciting and friendly space in which people can live, work, play and thrive. One that resonates with uMhlanga Rocks’ generations of family holiday-makers, the matrics living free, the business offering quality experiences, the resident both old and new, the property owner wanting secure values, and the investor in search of confidence. 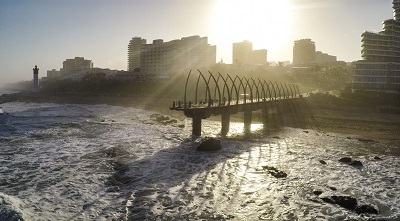 For uMhlanga Rocks, the process of uncovering its essence began in 2014, when a collective of uMhlanga Rocks property owners, developers and hotels, understanding that imminent development would re-shape uMhlanga Rocks both physically and in terms of perceptions, decided it was time to plan for a collective uMhlanga Rocks future. Facilitated through the uMhlanga Urban Improvement Precinct (UIP) structure, a cross section of uMhlanga Rocks stakeholders including businesses, property owners, residents, investors, the tourism industry, eThekwini Municipality (eTM) stakeholders and community organisations, were taken on a journey of discovery to find the essence of uMhlanga Rocks. Through a series of engagements that allowed for the expression of fears and challenges, dreams and opportunities, a new vision for one of Durban’s most iconic villages, uMhlanga Rocks came to the fore. We, uMhlanga Rocks, uncovered all the things that make us who we are, from what we believe and why we do what we do, to the way we act and how we want to be perceived by others. Synthesised into a motivating reason for being, uMhlanga Rocks has been positioned as a gateway from the stresses of the world, a place of family and community, where work, play and life are in balance. Convicted of this purpose, uMhlanga Rocks has created a set of principles to inspire a collective focus on exceptional spaces with exceptional experiences for all users. “The future uMhlanga Rocks will be different to the one we see today, but by pulling together under one identity, underpinned by this collective vision, we hope to inspire the various “cogs” working to keep the uMhlanga Rocks wheel turning, such as eTM, uMhlanga Tourism, the UIP, businesses and property owners as they position, promote and manage uMhlanga Rocks,” said uMhlanga Rocks Marketing Committee chairperson and representative of Granada Square, Shantelle Walters. As a place of authenticity and belonging, a place where memories are made, it is crucial that, as it develops, uMhlanga Rocks is still able to deliver that feeling to locals and visitors alike. “Some of our hotels are seeing four generations of families making memories and establishing traditions. So while concerns are that the Village of old is disappearing, the vision is mindful of uMhlanga Rocks’ history while shaping a new Village, and a new experience, one with better pedestrian accessibility and connections to green spaces and beaches; a higher quality retail and dining offering, a raised level of security, cleaning, greening and maintenance through the UIP and municipal structures, and a greater range of activations bringing life to uMhlanga Rocks,” said Cara Reilly head of place-making for the uMhlanga UIP management company UrbanMGT. To ensure that the quality of the shopping, dining and entertainment experiences in uMhlanga Rocks add a unique flavour to the place, Walters believes it is essential to understand that people choose to live in or visit an area because of their experience of it. “While we believe that what we have here is special, we are equally aware of the need to continually grow and improve the offering,” she said. A growing Village, improved offering and enhanced experiences will positively impact on the value of uMhlanga Rocks’ property prices and related contributions to the municipal rates base. This allows for the UIP and eTM to continue delivering services on-the-ground, ensuring the hard work put in over the past 8 years to elevate public space is maintained and improved. While current construction in uMhlanga Rocks is challenging the cleanliness and quality of public space, the UIP is working with developers and the municipality on the enforcement of construction codes of conduct and general maintenance of public space. “Although in a difficult phase now, once complete, not only will these developments free up additional funding for resources to manage uMhlanga Rocks, but they will enhance the public realm, with the new retail centres designed as outward-facing and people-focused” said Reilly. Working within the context of The City’s objectives, strategies and by-laws, the uMhlanga Rocks Marketing Committee, representing a cross-section of stakeholders, will oversee the practical delivery of this new brand and vision, helping to shape and maintain uMhlanga Rocks as a key destination in the greater Durban offering. Look out for new uMhlanga Rocks brand rolling out from December and into the New Year.